A lone German soldier keeps watch over a party of Russian prisoners captured around Warsaw. GERMANS ENTER WARSAW. 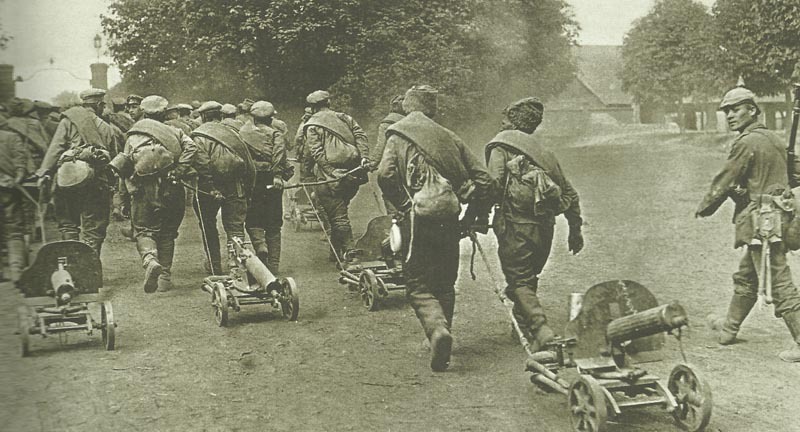 German Tenth Army attacks Kovno (until August 17), but repulsed on August 8 and 9. Austrian Fourth Army wins Battle of Lubartow until August 8, north of Lublin. General Sarrail made C-in-C French Army of the Orient ostensibly for Gallipoli, but possibly for Salonika. Gallipoli: Sarrail replaces Gouraud as French C-in-C Near East. Armenia: Turks re-occupy Van; Russians retreat towards Oilman in Persia. Royal Navy Tanganyika Flotilla reaches Funguvume railhead, Belgian Congo. Begins traction engine journey on August 15, but covers only 30 miles by August 28. Adriatic: Austrian U5 (Trapp) sinks Italian submarine Nereide off Pelagosa island (Italians land 4 guns, 2 MGs and 30 more men on August 9). Adriatic: Italian airship captured at Pola.